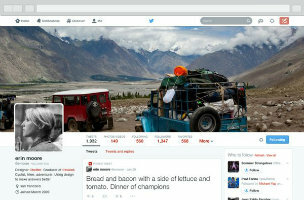 Twitter rolls out redesign to all users. WhatsApp grows to more than 500 million monthly active users. These stories, and more, in today's Morning Social Media Newsfeed. The latest profile page (which feels a lot like a Facebook-a-like redesign) began a slow rollout to Twitter users at the beginning of the month. Now, it would appear, all the kinks have been worked out: all Twitter users can now get the new look. VentureBeat The new profiles feature a three-column layout, cover photos and overlapping profile photos — just like Facebook and Google+. Specific new features include a “best tweets” section to highlight popular tweets; a “pinned tweets” feature that pins tweets that show “what you’re all about”; and finally a “filtered tweets” option, which chooses how you’d like to view other Twitter user’s profiles. The Verge You are now able to pin a single tweet to the top of your profile. Twitter says this can be used in conjunction with your regular bio to help visitors “see what you’re all about.” Any tweets you’ve published that receive a high level of engagement (via retweets, etc.) will appear larger than surrounding tweets. CNET Perhaps Twitter didn’t intentionally replicate the format of its rival’s profile page, but the still-maturing company, which only brought in $243 million in revenue during the fourth quarter of 2013, would do well to copy Facebook’s ad business. Twitter recently announced that it’s getting into the mobile app install and ad network business, giving advertisers access to a Facebook-sized audience of 1 billion devices. TechCrunch Here’s all you need to do: Go to this page (Note: For now, it looks like you’ll need to do this on a desktop browser, not your phone), scroll to the bottom, hit the tiny “Get it now” button. If you’re not already logged in, it’ll ask you to do so. WhatsApp Tuesday announced it has passed the 500 million active user milestone, up 100 million from December 2013. The company also revealed its users are now sharing more than 700 million photos and 100 million videos daily. Respondents say LinkedIn is their most-used platform for brand presence, however, Twitter boosts brand awareness. Sixty-eight percent of marketers believe social media is important, with 16 percent calling it critically important. At its F8 developer conference next week, Facebook is expected to present plans for a mobile advertising network, and in so doing turn on an additional revenue stream that could mint it billions more in mobile advertising revenue — but not if Google and Twitter have a say in the matter. A mobile ad network marries ad-serving technology to distribute inventory provided by advertisers across placements provided by publishers.